"Next year (1873) Victoria secured the first win with another non-club four (Melbourne, Melbourne University and Warehousemen). The other crews in the race were club crews, comprising two from Ballarat, a Sydney Rowing Club crew, and crews from Hobart Town and Geelong. The race was rowed over about four miles on the Lower Yarra - time, 25 min. 30 sec. 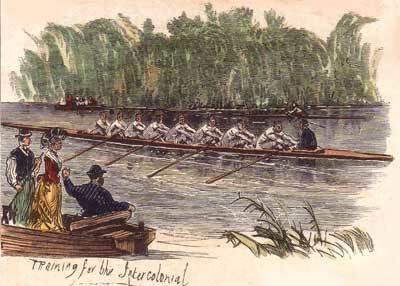 This race is generally recognised as the first "official" Intercolonial match." However this race commenced the great debate on amateur status in rowing. The Victorian Association did not permit professional watermen or those who competed for money prizes. The NSW Clubs were less concerned with competition for money but more concerned with those people who undertook labourering for work. Upon their return to Sydney, Arthur Fitzhardinge noted that the Victorian crew contained several manual labourers and thus not bona fide amateurs. It is reported that he said: "People confined in an office had no show against men who worked with their arms or their hands or in the sun all day." The trophy awarded to the winning Melbourne Crew. 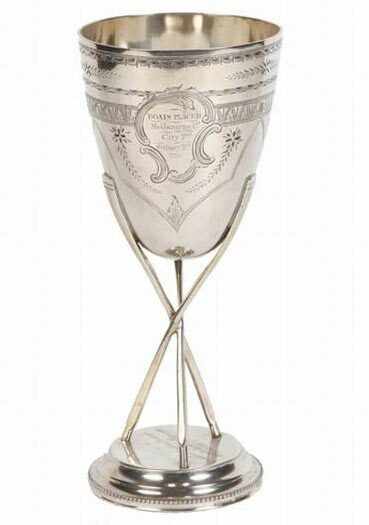 A similar trophy was also awarded to the second placed crew from Ballarat City. Manufacturerd by W Edwards of Melbourne. Whilst the sculling event was also raced on the Lower Yarra, it is not known whether it took place at the same time as the Four Oared Championship but is likely to have been conducted the day beforehand. Orr was never in the race having broken one of his sculls prior to the race. Just prior to the race he was provided with another pair which were too short. Carter hailed from the Civil Service Rowing Club and Bell from the Melbourne Rowing Club. "After much debate between Victoria and New South Wales over the amateur definition, a race was organized in 1874 over the Parramatta championship course, 3 miles 300 yards; time, 21 min: 59 sec. New South Wales won easily before a crowd of some 15,000 spectators and much press coverage. The 1873 and 1874 gig races were the first races of a character where the crews were representing their respective colonies, the other events before this date being more or less competitions between clubs or combination crews from the various colonies." The colonial character referred to by Lang was that both crews were now comprised of varying clubs. The Victorian crews for example contained two members from Melbourne Rowing Club, one from Ballarat Rowing Club and the other from Ballarat City Rowing Club. The amateur status question was resolved in this race by both colonies racing under their own definitions. Neither colony wanted the race to lapse. The preparation of the Victorians was set back with a crew member falling ill.
1st VIC – Bow: R Ward, 2: J Booth, 3: W C Bray, 4: J L Irving, 5: W H Tuckett, 6: J M Simson, 7: Thomas H Young, Str: Geo Fairbairn, Cox: Fred J Edwards. Average weight 11st 9lb. 2nd NSW - Bow: William R Benson, 2: John T. Arthur, 3: J. Morse McKensey, 4: William (Bill) G. Brett, 5: J. Henry Wilkinson, 6: T. Joseph Strange, 7: William Dind, Str: Charles C Medcalf, Cox: William W Thomas. Average weight 11st 3lb. "In October, 1877, the year in which eight-oared boats may be said to have first come into general use in many of the rowing centres in Australia, a challenge was sent by the Victorian Rowing Association to the Sydney and Mercantile [now Mosman] Clubs in New South Wales. This was taken up with spirit by the-last-named club, and the first eight-oared race took place on the 6th March, 1878, over about four miles on the Lower Yarra, from Stony Creek up round what is now “The Old River” to the Gas Works. "For about two-thirds of the distance the race was very interesting. At a quarter-mile Victoria was leading by a half-length. At the Sugar Works Victoria led by a clear length. Rounding the bend at the junction of the Saltwater River the New South Wales crew came up like a racehorse, and looked as if they would go right away. Victoria spurted, and for half a mile the boats rowed level. After that the Victorians went, gradually ahead, the pace having told more on the other crew. The New South Wales men pressed Victoria again half a mile from the finish, but were unable to catch up, and Victoria won by two lengths. No official or reliable time was taken." Alan May in his book Sydney Rows reports that the steamer Rescue with the umpire and Governor aboard, got stuck on a mud bank at the start of the race and were unable to see anything of the race. 1st NSW – Bow: William Cope, 2: Charles C Medcalf, 3: J Morse McKensey, 4: John Arthur, 5: William G Anslow, 6: T F Strange, 7: Alex Finlayson, Str: David Lord, Cox: Jenkins, Cch: Jim Clark. Average weight 11st 7lb. 2nd VIC – Bow: V Pearson, 2: J L Irvine, 3: J McKie, 4: A Loughlin, 5: W H Tuckett, 6: W Kemp, 7: Thomas H Young, Str: J Booth, Cox: Fred J Edwards, Emerg: Tunbridge, Average weight 11st 9lb. Following then success of the 1878 race, New South Wales invited Victoria to the Parramatta. The Victorians started as favourites but the NSW crew was a far superior crew and won easily. Alan May in Sydney Rows reports that the NSW crew rated 42 across the line.